(AP) LONDON - The Americans lived up to their billing as heavy favorites for gold. World champion Jordyn Wieber, however, did not. While the Americans breezed through qualifying in women's gymnastics Sunday, throwing down a challenge to Russia, Romania and defending Olympic champion China in the process, Wieber will miss out on the all-around final after finishing behind Aly Raisman and Gabby Douglas. Countries are limited to two gymnasts in the all-around and event finals. The Americans finished with 181.863 points, more than 11 ahead of second-place Britain. That was even with Wieber, Douglas and Kyla Ross bouncing out of bounds on floor exercise, their last event. But Russia, the 2010 world champion and runner-up to the Americans last year, European champion Romania and China are still to come. The team final is Tuesday, and the scoring starts from scratch. The Americans have come into the last two Olympics as world champions, only to leave with a duller shade of medal than they preferred. But this team is stronger, top to bottom, than the 2004 and even 2008 squads, and have a swagger LeBron and his buddies would appreciate. They know they're good - their four-point victory over Russia at last year's worlds was the equivalent of one of those SEC routs of a non-conference foe - and they don't much worry about anyone else. The setup worked in their favor, too, with the Americans starting on vault, their strongest event. All four of the Americans do Amanars, one of the toughest vaults in the world - a roundoff onto the takeoff board, back handspring onto the table and 2.5 twisting somersaults before landing. It's got a start value - the measure of difficulty - of 6.5, a whopping 0.7 above the vault most other gymnasts will do, and it gives the Americans a massive advantage after just one event. Just how big? The Americans dropped a 15.8, a mark most other countries would kill to have as their top score. It's not just that the Americans have the Amanars, it's that they make them look so easy. Gabby Douglas' toes were so pointed in the air she looked like a directional arrow while McKayla Maroney's legs were so straight you could use them as a ruler. Each American took a hop on their landing, but it was a minor deduction and the U.S. left the event with a score of 47.633. They held their own on uneven bars thanks to Ross and Douglas. Ross, who missed last year's world championships because she was too young, looks like a hummingbird as she flits between bars, seeming almost weightless. Douglas, who has been dubbed "The Flying Squirrel" by national team coordinator Martha Karolyi because of her release moves, had the crowd oohing and aahing as she flipped herself so high above the bar, she could have changed one of the spotlights. Her feet slammed into the mat on her dismount, and coach Liang Chow threw his arms up in the air before sprinting around the end of the podium, pumping his fist. Douglas scored a 15.333, and the Americans were cruising. But Wieber was already showing signs of trouble. The U.S. champion came in as the heavy favorite for gold, having lost only two all-around competitions since 2008 - both to U.S. teammates. But she lost to Douglas at the Olympic trials earlier this month, and wasn't her normal rock-solid self Sunday. She had a form break on a handstand on uneven bars, and a few wobbles on balance beam. After Ross and Douglas both flew out of bounds on floor exercise, Wieber got way too much power on one of her tumbling passes and had to take a step back to steady herself. 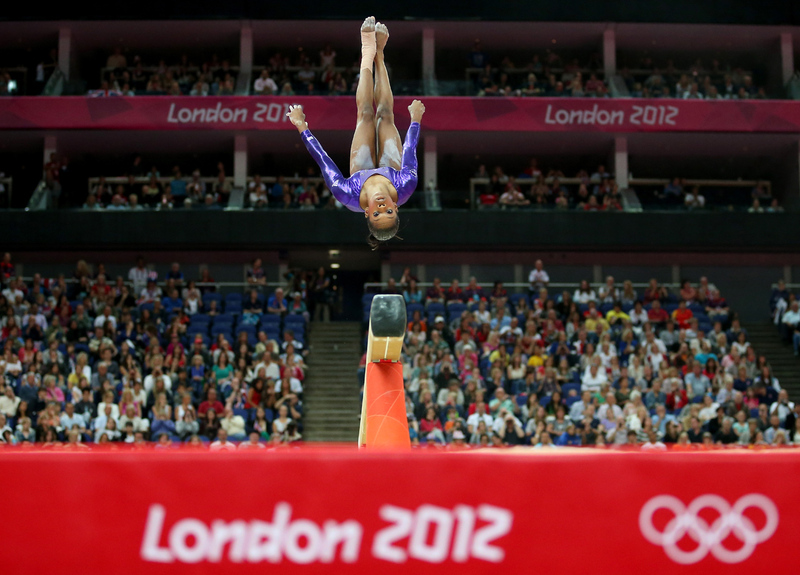 Only problem was, it was out of bounds, and the deduction all but ended any chance she had of staying in the top two.